CHENNAI, DEC. 2. Non- interference, particularly by politicians, in police functioning, transparent working of the department, a professional approach and more interaction with the media would help enable the police to present a better image of themselves. 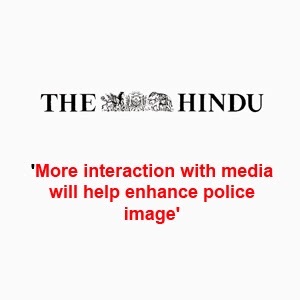 These suggestions came forth during a panel discussion on ``Tamil Nadu Police-an image audit'', organised by Prime Point Foundation, a public trust for promoting public relations and communication awareness, here on Saturday. Besides the former Tamil Nadu Director-General of Police, Mr. V. R. Lakshminarayanan, Mr. S. Ganapathy, DGP (Training), Mr. J. K. Tripathy, Joint Commissioner of Police, South Chennai, Mr. R. Desikan of Consumers Association of India and Mr. G. C. Shekhar of Hindustan Times constituted the panelists for the programme, anchored by Mr. T. Kannan, former Joint Director (News), Doordarshan. Presenting their views from their professional experience and lacing them with lively anecdotes, speakers felt that a vigilant Press, transparent functioning by police and greater interaction with the media to dispel rumours were necessary to enhance police image. The public perception of police should also be understood so that the police were able to discharge duties in a more effective manner. The Press could avoid highlighting trivial issues. "The trouble in this country is that everything is getting politicised'', pointed out Mr. Lakshminarayanan quoting various incidents during his career. Politicisation of police and criminalisation of politics should be stopped. The media had to play its role and the judiciary should give up its lackadaisical attitude, he said. The media presented the news only in a balanced way. If the police erred, the Press had the right to present it to the public, pointed out Mr. Shekhar. According to Mr. K. Srinivasan, founder-managing trustee of the trust, a police image audit was conducted among randomly selected 175 respondents. The exercise revealed that the police investigation skills seemed to be uppermost in the minds of the people. A large number of respondents felt that the police should avoid political interference and there were also suggestions that the force be autonomous. For more details about Image Audit, contact K. Srinivasan, Chief Strategist.